Shigeru Miyamoto is considered by his peers to be the greatest video game designer in the world, and called "The Spielberg of Video Games" by Time Magazine (May 1996). Shigeru Miyamoto, 50, is the Senior Managing Director of the Entertainment Analysis and Development Division for Nintendo Co., Ltd. in Kyoto, Japan. In this capacity, Miyamoto serves as the creative force behind the world's most popular and enduring video games for the Nintendo Game Systems. 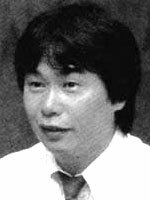 Miyamoto joined Nintendo in 1977 as a staff artist. As creator of the hugely popular Mario and Zelda games, he is one of the most revered figures in the video game world. In 1981, Nintendo released Miyamoto's first masterpiece, the arcade game Donkey Kong. In 1985, Nintendo released the NES with Miyamoto's Super Mario Bros. The classic side-scrolling action game set the standard for all future home console video games. Eventually, more than 40 million units were sold worldwide, and a series of mega-hit titles was born, including the 1996 N64 best-seller, Super Mario 64. To date, Miyamoto has worked on more than 80 different Nintendo video game titles. More than 164 million video games in the Super Mario series have been sold worldwide. Miyamoto's most recent video game projects include Super Mario Sunshine, Pikmin, Luigi's Mansion, The Legend of Zelda: Majora's Mask, Star Fox 64, Mario Kart 64, and The Legend of Zelda: Ocarina of Time, which has been called the greatest video game of all time. In 1998, Miyamoto was honored as the first inductee into the Academy of Interactive Arts and Sciences Hall of Fame. Miyamoto holds a degree from the Kanazawa Municipal College of Industrial Arts and Crafts in Kanazawa, Japan.